Teach yourself to find true happiness. Learn to cope with stress and those everyday hassles that continually drag you down. Bring yourself back on track to achieve your goals and realise your dreams without resorting to drugs and expensive courses. Happiness is like a morning mist, a phenomenon which is more easily appreciated from a distance. Up close, it is far less tangible. We know it is there. We can feel it all around us, but it seems to have lost some of its magic. In a short time, those forces which produced it in the first place will change and it will disappear. Is this really what happiness is all about, waiting for a particular set of conditions to occur before we can experience it, and then only briefly? If we could know exactly what it was, what made it possible, we might be able to recreate it ourselves whenever we wished. The thought is appealing and not as impossible as it might at first seem. There is something allied to happiness that we can monitor and experiment with – an emotional condition called enjoyment. We can experience it on varying levels; associate it with specific situations; we can even replay it by recalling past memories. When it is with us, we are more uplifted and light-hearted than when we are without it. By comparing one period of enjoyment with another, we can decide for ourselves which is more pleasurable. And the one thing we all know for certain is when we are definitely lacking enjoyment. This little book is a guide to identifying those times which are least or most enjoyable in your life. The steps suggested are both simple and small. You won't have to change your lifestyle dramatically to accomplish any of them. Neither will you have to abandon any plans you may have already made for your future. In fact, this guide will help you achieve them with far more satisfaction than you could have imagined. Day by day, your confidence and self-esteem will improve as you move closer to your goals. Slowly but surely, the stress will begin to ease as you regain control of both your life and your environment. Family and friends will notice the difference as you become a happier person to be around. You will start viewing work as a challenge rather than a drag. And those dreams and aspirations you'd almost given up on will suddenly be worth serious consideration again. Not all of the situations touched on will apply to you personally, but most can be adapted to relate in some way to your own unique circumstances. Following each everyday problem or situation is a simple, practical suggestion which will help you understand the problem, find your own solutions and gain a better insight of yourself. Some of the suggestions may seem irrelevant, some even bizarre, but by adopting them you will be employing the same powers of reason, consideration and determination needed to help you resolve the issue in question. In any order you choose, take a situation you can readily identify with and try one of the accompanying suggestions relating to it. Repeat it the following day, if you so wish, or choose another; but give at least one of them a go. And think on it well - how you feel afterwards, whether it has changed the way you view yourself or others, and any ideas the experience may have sparked which will help you lead a happier life. This is what true happiness is all about - enjoying life. 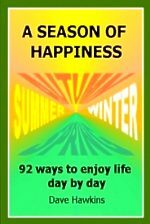 The pages in A Season of Happiness offer 92 ways to uplift your spirit and regain self-confidence - 3 months of hope for your future which can easily be turned into a lifetime of happiness. Teach yourself to find true happiness. Learn to cope with stress and those everyday hassles that continually drag you down. Bring yourself back on track to achieve your goals and realise your dreams without resorting to drugs and expensive courses. 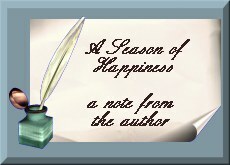 A Season of Happiness lists the most common problems of day-to-day living and couples them with simple, enjoyable ways to help you find the solutions that work best for you. Make your life worth living again. Learn to turn those negatives to your advantage, and enjoy doing it your way. Dave Hawkins was born in the Midlands of England just after the war. He emigrated with his family in the early 70's for a better lifestyle and has never looked back. He has lived in three states in Australia, finally deciding that Western Australia was the place to be. Click this image to view or print a preview of the ebook.